Roombots are a modular self-reconfiguring robotic system, and are a direct response to the pressure on space that is so common within large cities today. Each Roombots module is made of two spheres, approximately the size of a grapefruit, and contains three motors (for rotational movements), on-board computation, and a battery that allows for at least one hour of operating time. Modules also contain a latch-based connection mechanism that allows them to connect to each other or to connector ports in the environment. The rotational movements and the dynamic connectors allow the modules to form any shape that may be desired – this means that you could have breakfast on a table, but while you are at work during the day, the Roombots transform into a series of chairs for a party that you are hosting that evening. 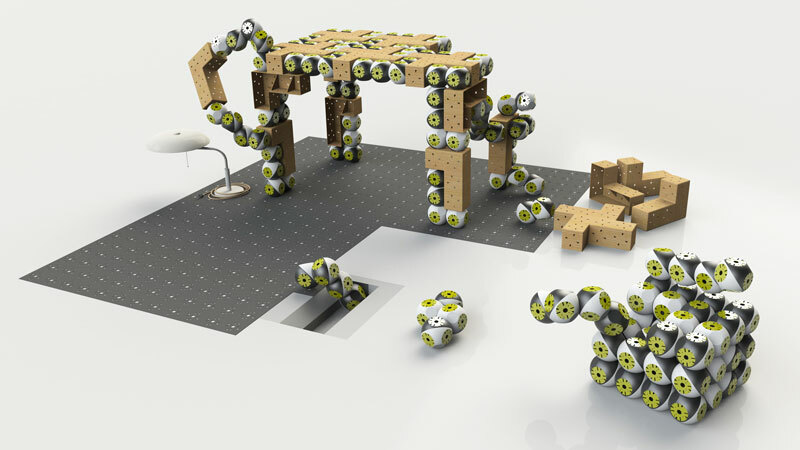 Using connector ports embedded in the floor, walls and ceiling, Roombots can crawl and climb on any surface, meaning that furniture does not need to be connected only to the floor, but can also hang from the ceiling or stick to the wall. As it may not always be possible to embed ports everywhere in the room, the Roombots have also been designed to be able to “walk” using an oscillating motion controlled by a network of coupled oscillators in the modules, to allow them to travel across a room. The net result is that the modules appear to walk like a turtle or wiggle like a worm until they reach their intended point and fix on to a connector port. The team behind the Roombots have had to overcome a series of research challenges in terms of hardware and control. For the dynamic connector for instance, the locking mechanism must be strong but flexible, and must be able to lock in any position and arrangement with no translation or rotation of the structure after locking. 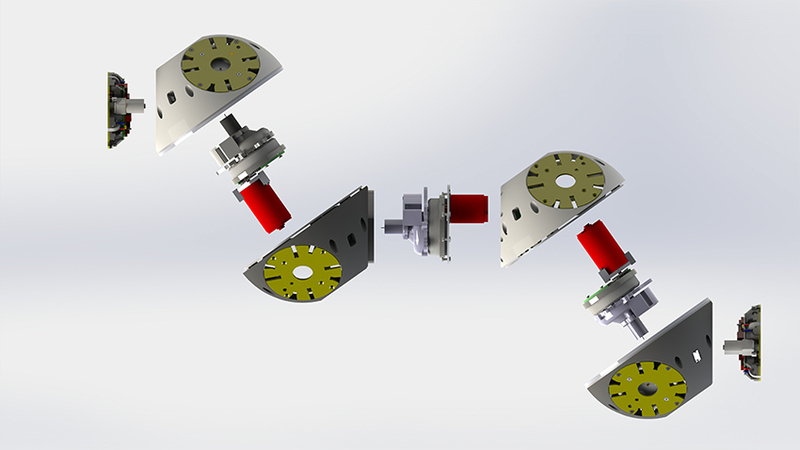 Next, grippers must be large enough that even when modules do not match up perfectly, the locking mechanism must still be able to fit into place, but small enough so as to still be fully contained within the robot. The connection mechanism has been designed to deal with both issues by employing a scooping mechanism, which researchers say allows up to 3.5 mm misalignment. Many other problems had to be solved for the Roombots to work properly as demonstrated on a series of videos found here. So far, Roombots modules have been used to walk, negotiate corners and autonomously create simple table structures by connecting with each other and using connections to lift the tabletop, but researchers are still working on research and technical challenges such as compensating unwanted bending in the mechanical structure (related to building larger complex 3D structures), developing the best-suited algorithms for reconfiguration or locomotion control, and finding the most appropriate interaction strategy for the end-users.